Prepping rushed is prepping butchered, the ol’ saying goes. That’s especially applicable to “bulking up” your emergency pantry. Bulk survival food is what separates men from boys, once they decide to “spiral out and keep on growing.” It’s arguably the biggest investment (money-vise) you’ll have to make on your “anti-calamity front” and this bulk survival food review will show you all the right moves. It all starts with water, to be sure. The official recommendations state 90 gallons are required for sustaining one person during a 3-month period. Let’s think big here, though. Let’s say you’re in a survival scenario for a whole year. Water purification is a given, but what about the food? This iteration of our bulk survival food review included “available information” as a minor criterion as well. It’s a slight push aimed at companies telling you more about their products. There’s a lot of specifications out there, offering little to no info about the kit they’re “trying” to sell and this is a response to that trend. 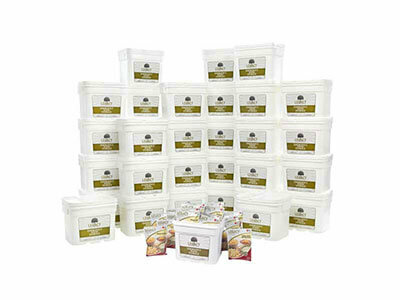 With more than 6 serving per day, this survival kit definitely shines in the abundance department. 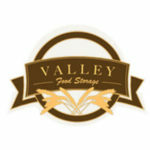 Everything Valley Food offers comes in mylar bags with 25 years of shelf life. 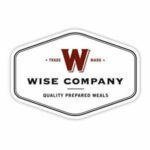 Their food comes completely clean of any unhealthy preservatives or other unwanted additives. They steer clear of GMO and hydrogenated oils as well. You can also get dairy and gluten-free options in case your dietary needs demand it. The mylar bags can be easily resealed once opened, via industrial strength closure zip system. The pouches are Nitrogen-Flushed, which is a method much superior to the “old-school” vacuuming process. This will keep your survival stash in good condition for much longer periods of time. 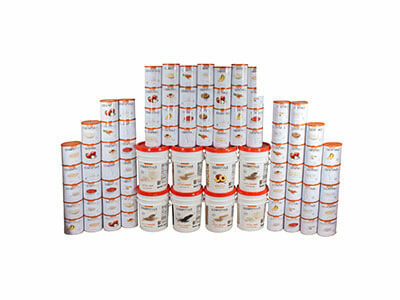 The food is also freeze-dried, which is a high-caliber food-preservation method of today. Premium kit is their top-seller and it contains 8 different types of breakfast (varieties of pancakes and oatmeal), paired with 17 lunch/dinner options (everything from potato soup, rice&chicken pilaf, and chili mac to lasagna, pasta Alfredo/Primavera, and Beef Stroganoff). If you want some sides or desserts, however, you’ll have to purchase an add-on, also available in their portfolio. 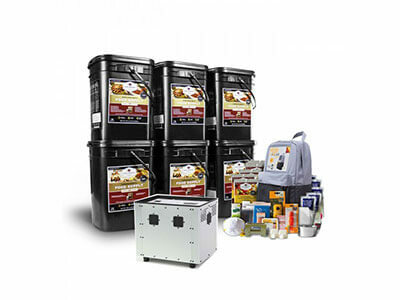 Main Features: 6 airtight buckets with handles and locking mechanism; portable generator, ideal for lighting and keeping the appliances or medical equipment going; “solar backpack” with solar batteries/panels and other survival tools like blankets, ponchos, flashlights, portable stoves, etc. This bulk survival food kit really covers it all! It features enough food for a whole year for 1 person, accompanied by enough power to get you through the thickest of emergency times. The shelf life of the food is 25 years. The aforementioned 6 buckets offer 2 meals per day, ranging from creamy pasta and cheesy lasagna to crunchy granola and apple cinnamon cereal. There are 17 different meals in total. All the food is sealed within mylar pouches, with 4 servings per pouch. The food is either freeze-dried or vacuum-sealed, depending on the dish in question. Mylar ensures a proper airtight seal, which forms a two-pronged protection, alongside the bucket containers. The solar backpack contains 5 days’ worth of supplies. It’s a combo between food/water and survival tools like blankets, matches, portable stove, first aid kits, and hygiene kits, among other items. If you already have all of the supplies on hand, this backpack makes for a great prepper’s gift to someone who needs to up their survival game. Among 5 bulk survival food options, this one is in the middle when it comes to price and on the very top when it comes to the number of servings per day. Neat little combo, we thought to ourselves. All of the cans are made of stainless steel and double-enameled for rust and age prevention. SuperPails are made of food-grade sturdy plastic and have metalized bag lining for keeping pests and mold away. Every food packet comes with its own oxygen absorber. A great option offered by Emergency Essentials is their “PrepAsYouGo” program. It allows you to start ramping up that emergency food supply even if you can’t afford it all at once. There’s also a comprehensive chart on their website, showing exactly what you’ll have to pay per month if you decide to go for it. One other thing that caught our eye is the “low-price guarantee.” If you buy a product of theirs and find a similar, cheaper one in the next 30 days, they guarantee to match the lower price. As the negatives go, there’s no shelf life specified. You’re offered a link to an article that’s not there. That’s a swing and a miss in our eyes, alongside the absence of the total weight info. That’s just lazy. Legacy is the king of data. You’ll get surgically precise info about every single meal. You’ll know exactly about your intake of calories, fats, carbs, fiber, and protein per serving. The shelf life is 25 years. Every meal comes with an air absorber, which should be removed before preparation. Furthermore, they all come in airtight mylar bags, the established industry standard by now. An oxygen absorber is packed on top of the Nitrogen flush. 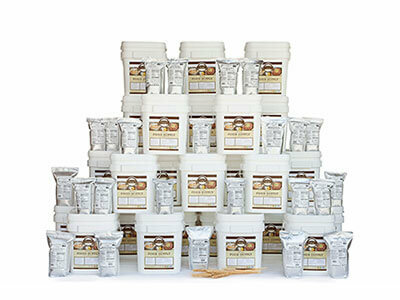 By the very number of calories, you can see that this kit is stacked with high-quality food. Honorable mentions include free shipping and satisfaction guarantee. 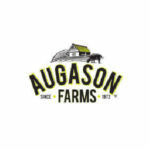 Free shipping applies to every order in the north region of 50 bucks. The downside, however, is the fact that it’s not valid for shipping outside the lower 48 states. The kit has 23 different meals. Nothing fancy or out there, but all the signature dishes you would expect are there. The food is traditionally easy to prepare and the taste is great for the most part. There are a few misses here and there, but those are rare exceptions. After seeing the pricing in this corner of survivalism, it’s clear why this bulk survival food review stressed how important of a decision this is. Anything that can shake you for a couple of thousands should be considered many times and “cut” only once. That’s why this review listed the best of the best when it comes to bulk survival food. These are all well-renowned companies with customers all across the USA and the kits really shine in all the necessary areas. The packaging is flawless and ensures 25+ years of shelf life. Mylar bags, #10 cans, and emergency buckets really raised the bar on survival food storage as well. The taste is “like it was never frozen.” Freeze-drying brought back the flavors that were missing for so long in survival-friendly products. MRE means you can just add a cup (or more) of water and your lunch/dinner is served. Depending on how hot you like your food, you can adjust the temperature of the water. Most reputable companies nowadays steer clear of artificial ingredients, preservatives, GMO, and the likes. Gluten and dairy-free options are usually there and the presence of any kinds of nuts is always clearly marked. Emergency long-term food supplies really have reached new ground. You can decide whether that’s a good or bad thing, as long you and your family do it on a full stomach.